Montecito, California debris flows from the 2017 Thomas Fire, the biggest fire in California history until surpassed in 2018 by the Mendicino Complex Fires. This year was year four of filming with 43,000 total miles of observation to date. 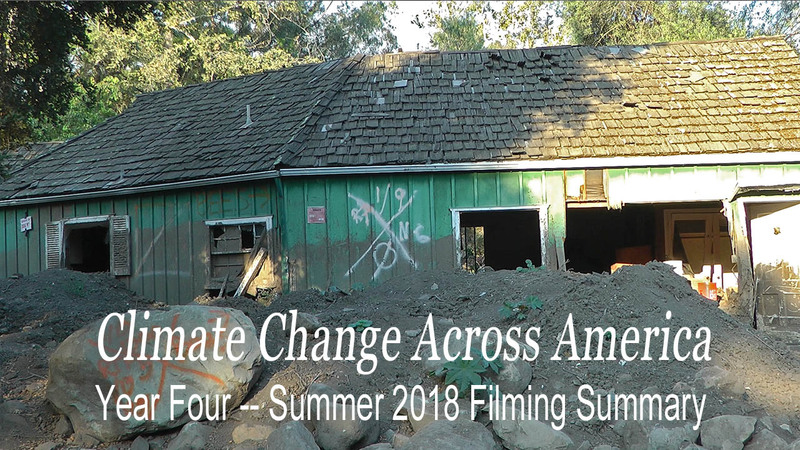 In the summer filming season in 2018, for 16,000 miles from Austin to the Arctic via California, we literally observed climate impacts all the way. Rarely were we out of sight of forest mortality. The fire season started early again and grimed our images with haze. Massive new attacks of bark beetles and leaf miner were common, reaching pandemic proportions north of central British Columbia all the way to the North Slope of Alaska. The results of unprecedented fires and mudslides in California saddened our lenses. Glaciers are rapidly retreating. Freshwater lakes are being compromised with salt water from sea level rise. Permafrost melt ponds line the highways of Alaska and the Yukon. And the dryness was striking. We had only four days with rain. There was no rain from Austin until the Cassiar Highway in British Columbia, and hardly any clouds. And warm! There was hardly any snow an any mountains anywhere except above 14,000 feet. Answers to our citizens queries about climate change from Canada and Alaska, while varied about summer warmth and precipitation, were unanimous in that winter warmth and spring’s earliness were unprecedented in their minds. Two important relationships emerged from this trip: Because spring is coming 30 to 45 days early, and summer warmth is greater than normal, snowmelt is completing even more rapidly than 30 to 45 day early onset leaving rivers at normal end of summer low water in June. Vegetation too is correspondingly dryer leading to the ever increasing amount of burn area we are now seeing. Because forest mortality is found in almost all areas, and because most forest species are being attacked by one form of insect or another or are simply succumbing to drought or disease, and because even the best-case scenario emissions reductions allow warming to triple and quintuple by 2050 and 2100, forest restoration to restore natural carbon sequestration does not seem possible with current warming. 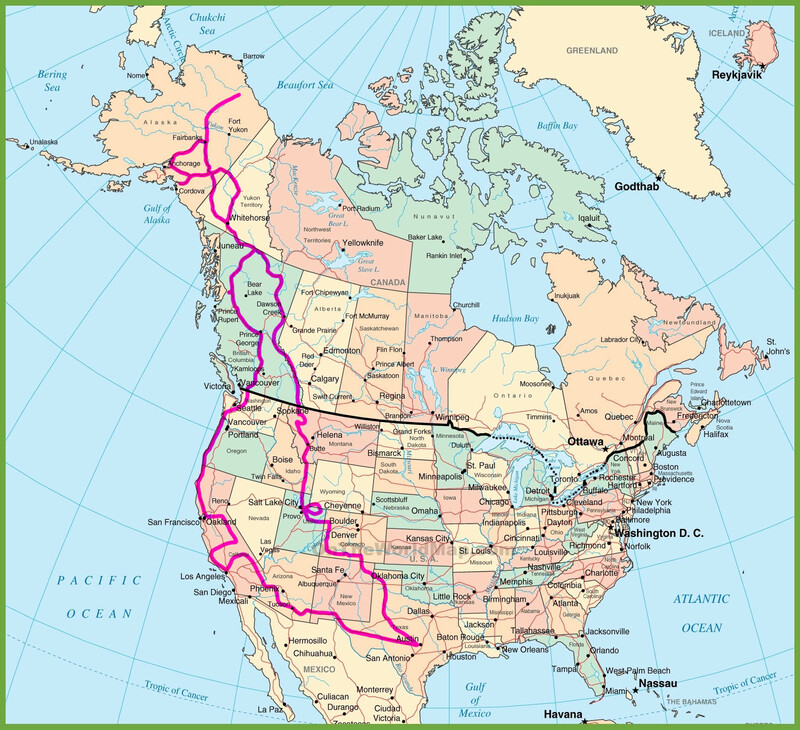 Our route went from Austin, across southern Arizona to southwestern and central Western California, then to Los Angeles and up the coast to Washington. In British Columbia we travelled from Vancouver to Prince George, then west to the Cassiar Highway to the Yukon and Alaska Highway, then to Whitehorse and the Klondike Highway to Dawson City, then to Alaska and Chicken. From Chicken we went south to Glenallen and Chilkoot in southeastern Alaska, then to the Matanuska Glacier near Anchorage and back to Delta Junction and the Denali Highway where crossed central Alaska to Denali National Park. From Denali the route went to Fairbanks, then the Dalton Highway to north of the Brooks Range. Then back to Denali and south to Parmer to pick up the beetle attack south of Denali, then east to the Alaska Highway and back through Yukon, BC and Alberta to Jasper and Banff National Parks. From there the route went through western Montana and Glacier National Park, through Idaho and the Wasatch east of Salt Lake, then to western and southwestern Colorado and back to Texas. Beetle Kill — Pine beetles, spruce beetles, and fir beetles (all native) are almost everywhere we went except the immediate coastal forests from Northern California to Washington. Greykill from old beetle attack was mostly what we observed with last year’s attack showing as redkill as described below. Redkill is conifers with bright red needles where beetles killed the tree the previous year. Greykill is standing dead beetle killed trees where needles have fallen in previous years attacks. In Canada and the US, 96 million acres of forest have been impacted since the turn of the century with 60 to 90 percent mortality. This is an area the size of New England, New York and New Jersey combined and does not include trees killed from fire. Saguaro National Park – Changing rainfall patterns where more rain is coming in more extreme events with longer dry periods in between has resulted in no new saguaro seedling growth for 20 years. While saguaro in the national park are relatively healthy, across southern Arizona saguaro have major health issues. Multiple species of cactus and shrubs also show significant mortality from drought stress , insects and disease in the national park and across southern Arizona. Sequoia National Forest, Sequoia National Monument, Sequoia National Park, Kings Canyon National Park, and Yosemite – Bark beetles are attacking multiple species in amounts that range from triple to quintuple normal mortality to 70 percent of individuals. Safety logging of drought and beetle killed trees is widespread. California Fires – Unprecedented is a big word. Fifteen of the twenty largest fires in California have burned since 2000. Since the 1970s across the West, area burned is up nearly 1,300 percent, the fire season has increased 60 percent from 138 to 222 days, and human ignition accounts for only a small portion of the increases. About 5,700 homes were destroyed in the Tubbs Fire in 2017 in Santa Rosa alone. Nearly 10,000 structures were burned in 2017, about triple the number burned in the previous record year of 2015. British Columbia – Though overall area killed by beetles is down from the 40 million acres killed in the 2000s, active beetle attack is evident almost everywhere except coastal regions. Along the Cassiar Highway leading from central BC to the Alaska Highway in the Yukon, leaf miner is evident in pandemic proportions in aspen, poplar and willow. The leaf miner attack in poplar and willow is a surprise that is not evident in academic literature. In northern BC, permafrost melt is evident in numerous melt lakes. In Northern Rocky Mountain Provincial Park, beetle kill is enhanced. Alberta – We only touched a sliver of Alberta in Jasper and Banff National Parks. In Jasper National Park and adjacent forested lands, the north one-third of the park is under a new attack from spruce beetle with redkill widespread at 70 percent and more in some areas. Yukon Territory – Beetle kill is widespread along the Alaska Highway. This is something else we were surprised to see that is not well captured in the academic literature. Along the Alaska Highway, and the Klondike Highway to Dawson Creek, leaf miner impacts are also pandemic with attacks of aspen, poplar and willow very widespread. Permafrost melt is significant along the Alaska Highway. Alaska – Fire scars are extremely widespread. Permafrost melt is extreme along the Glenn Highway from Glenallen to Tok. Roadway damage is widespread and extreme across much of Alaska with particularly extreme damage in southeastern Alaska, along the Dalton Highway to Prudhoe Bay and in the Fairbanks Area. Bark beetles are active in epidemic proportions from just south of Denali National Park to south of Talkeetna. Sporadic redkill is evident across much of the rest of Alaska. Leaf miner is pandemic in aspen, poplar and willow in much of Alaska. In Denali, trees are starting to grow in the tundra. Montana – Active beetle kill is in northern Montana and southern Glacier National Park. A major wildfire had burned our budworm observation area between Going to the Sun Road and West Mary. Idaho – Our route skipped forests in Idaho. It was powder dry, but it’s normally powder dry in late summer in the lowlands of Idaho. Utah – The Wasatch east of Salt Lake City showed significant to epidemic beetle kill with active redkill widespread at all forested altitudes. Colorado – Redkill was active in northwestern Colorado and in the Ouray, Silverton and Durango region. Fire – On our return trip, smoke was bad to extreme from the Yukon through the Rockies.